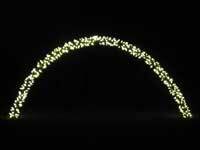 Add the WOW to your Christmas Lights with a WowLights 8 foot arch! Just attach the arch halves, sink the stakes, and your arch is ready to go in minutes. Each arch includes 8 individual outputs of warm white LED lights. Measures 96in X 44in, includes stakes and installation instructions. Also available in a 2 pack and 2 pack with controller. Timing for arches available in all Christmas Sequences.